The Pros and Cons of this Sportstech SX500 Exercise Bike. There is a lot a smart tech and interesting little details to enjoy in this Sportstech SX500 Indoor Cycle. The first benefit to talk about here is the use of technology within the console and its training programmes. There are different in-built programmes on offer that allow users to enjoy a fantastic workout. On top of this, there is the compatibility with the app and smartphone controls. This diversifies the workout further and creates more interest. Some will find this all a little complicated. 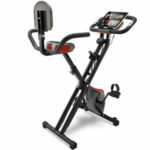 Yet, there are happy buyers that find this Sportstech exercise bike easy to adjust to their needs. This means a customised session that can lead to some great results. Then there are the details in the performance and design which help users enjoy the workout further. There may be a large 25kg flywheel and intense resistance system, but there is also plenty of padding on the armrests, a smooth motion and minimal noise. The frame is also adjustable to suit different user heights, so is great for the whole household. The downsides with this Sportstech SX500 really are minimal. 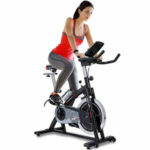 At the time of writing this review, this spin bike had a great rating from users online. This could all change down the line if there are issues with the longevity of the indoor cycle. But, for now, everyone is very happy with what they have received. One minor complaint here is the weight of the bike, because of that flywheel and frame. It isn’t the most portable option, even if it does have transport wheels. Does this lack of criticism mean that this Sportstech SX500 Indoor Bike is highly recommendable? At the start of this guide, we asked whether this is a piece of exercise equipment that people would actually want to use. The positive comments on this machine show that this is indeed the case. The complexity and technology may be too much for the average user. Still, many fitness fanatics will love the different options. The quality of the build and basics of the workout are important here too. 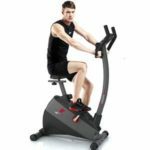 Therefore, it is difficult not to recommend this Sportstech exercise bike to those that want to push their workout to the next level. 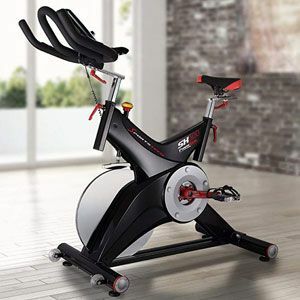 Find more reviews about the Sportstech SX500 Indoor Cycle on Amazon here.